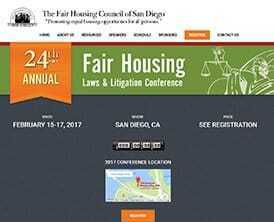 The Fair Housing Council of San Diego hosts an annual conference in San Diego attended by Attorneys and federal, state, NGO and non-profit employees who work in fair housing and anti-discrimination. This project included their main website in addition to conference information and registration. The conference information included speaker bios and headshots, the conference schedule and details about each session. 2017 was the third year Thrive supported the annual conference.